When my husband went to the Philippines, he fell in love with the pineapple. On a trip to Tagaytay, we got pineapples from one street vendor. It was only 20 pesos per piece. It was probably the best pineapple I’ve ever had and from that time, it also became my husband’s favorite fruit. In Korea, fresh pineapples are imported from — where else? — the Philippines. You can buy a whole “Dole” or a “Del Monte” for 2,980 KRW ($3) these days. It is cheaper because it’s summer :D. In the spring, fall or winter, you can get one for 4,980-6,000 KRW. So every Saturday when we shop for groceries, we pick one or two unpeeled pineapples depending on the price. You can have them peeled from the store but my husband prefer that I peel them. He said too much of the flesh is waited with the peeling machine used at the stores. 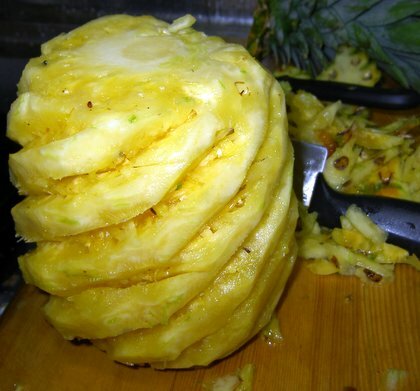 Fortunately, I learned how to peel a pineapple the Pinoy way from my mother. I peel the thick skin first from top to bottom. Then I slice the “eyes” one by one diagonally. So I end up with a pretty looking peeled pineapple. I don’t throw out the “eyes” because I use them to make pineapple jam! This one, I learned from my sister. Previous Post:Root canal treatment… ouch!